2015 was a record breaking year for the IEEE Young Professionals publication and I would like to thank you all for all of your contributions. In 2015 we officially re-branded our publication from GOLDRush to IMPACT by IEEE Young Professionals. In 2015 we published over 70 unique articles and we grew our reach via social media to beyond 11,000 followers. We received over 100,000 individual views and more than 5,000 comments/likes through our social media. We covered stories based on geographic location to highlight wonderful work our young professional members are undertaking in their respective sections. We covered IEEE volunteers involved in major global events such as the earthquakes in Nepal and the war in Iraq. Our editors interviewed world experts and provided tech reviews of cutting edge research and development. We profiled over a dozen IEEE members who have made big impact through their volunteer and leadership. Listed below are a few of our high impact articles. Want to become and editor or contributor? We are actively seeking editors and contributors. To become an editor you must be highly proficient in the English language with writing, editing and proofreading experience being highly desirable skills. Contributors of articles are welcome with all levels of English as our editors will strive to assist you in getting the article publication ready. To become an editor or active contributors please email Eddie Custovic. The Young Professionals track for the IEEE Region 10 Conference, TENCON 2015 started with the session on “Rejuvenating Young Professionals” by Mr. Ranjit R. Nair, IEEE Region 10 Young Professionals Coordinator. During his session, Ranjit emphasized the benefits of being a Young Professional in IEEE and how IEEE can be beneficial to them. He cited examples of various young professionals across the globe who have been active IEEE members and benefited very much by contributing to technology and society. Special mention was given to members in academia and how to leverage the benefits from IEEE. There was also a discussion about the need for a Young Professionals Affinity group in each section and how a local affinity group can provide benefit to members. The Next session was a talk by Dr.S.N.Singh on the topic “Opportunities for Academics in Industry”. With his vast industry experience and then being an academic serving at various institutes, elaborated on the needs of engineers from each area and how Industry Academia linkage can promote research. He cited examples on how we can promote the linkage between academics and industry. During his talk, he elaborated the need for academics to raise up to the current industry standard so as to take part in projects from industry. There was good interaction during the Q&A session on various challenges faced by academics to involve Industry and possible ways to resolve these. This was followed by a Discussion on “How Academics can leverage benefits of IEEE”. There was a fruitful discussion between the speakers and the delegates. IEEE 2017 President, Ms.Karen Bartleson was also present and contributed significantly to the discussions. Some of the major discussion points and suggestions raised are described in the next paragraph. Dr.S. N. Singh suggested promoting Young Professionals and spreading more awareness to local sections especially with those who do not have an Affinity Group. Young Professionals awareness has to be made as a main track in the conferences. Mr. MGPL Narayana, R10 Vice Chair, stressed on the need for career opportunities and mentioned about the India strategic initiative programs. Jithin Krishnan, EMBS Young Professional volunteer, suggested having tool based training programs. Karen Bartleson, IEEE President Elect 2016 pointed out that even though technology changes every couple of years, the institutional curriculum changes only once in seven or eight years, she emphasized the need to have a dynamic structure so that the course curriculum come at par with changing technologies. Anil Kumar C. V., PhD resource scholar suggested that increasing the number of free downloads of IEEE papers help students (especially graduate students) in their research work. This will help reduce the economic constraints faced by the members from developing nations. Mr.Ajin Baby, Chair, IEEE Kerala Young Professionals AG, pointed out that Government and Universities have to be convinced to promote entrepreneurship. Programs like GDP boot and employment opportunities can be conducted to promote this. The units should provide a sandbox environment for interested students to try out entrepreneurship so that they can pursue the same. Ms. Preethy V. Warrier, Secretary WIE Kerala Section, shared her industrial experience, being a Young Professional and also suggested a method to promote women in the field of engineering. Identifying the reasons that are pulling back young girls from entering the world of technology after their graduation, finding out solutions and implementing them will provide more opportunities to them. Dr. Paul Chen, Chair of IEEE Macau Section expressed willingness to start a Young Professionals Affinity group after hearing about the benefits. The discussion led to opening the doors of opportunities for members as well as other students and professionals. The session came to a close with a group photograph of the attendees and speakers. The event was realized with support from Region 10 and MGA Young Professionals Committee. Today we had the privileged of speaking to Dusanka Boskovic to learn about one of the smaller but very active IEEE groups based in Bosnia & Herzegovina. Can you tell our readers about the IEEE Section in Bosnia and Herzegovina? The IEEE Section in Bosnia and Herzegovina was founded in 2005, and we are now celebrating our 10th anniversary. We are a relatively small section, with approximately 300 stable members. Although the majority of our members are members of the Computer Society and the ComSoc, we have also very active Chapters linked to the Power & Energy, the Industrial Applications, and the Systems, Man, and Cybernetics Societies. The Chapter’s activities focus around organizing technical meetings with interesting and motivating lecturers. We try to be regular in making use of the ‘Distinguished Lecturer Program’, and bringing to our members recognized experts and topics on emerging technologies. Since our members are mainly from academia, we are engaged in technical co-sponsorship of our local conferences, with motivation to improve their quality. We were also bringing some prominent IEEE conferences to Bosnia and Herzegovina, as a region.Our Student Branches and YPAG are in addition to technical activities, engaged in organizing workshops related to soft skills, and also social events, technical excursions and competitions. Young Professionals AG were the organizer of some very interesting and popular training, focusing mainly on communication skills and emotional intelligence. They are motivated in helping students to make easier careers starts and they organize students’ visits to major companies, panel discussions related to job opportunities and career development. Such activities are performed in co-operation and conjunction with our Chapters. What are some of the key achievements of the IEEE in BiH? Providing a framework for motivated volunteers to work together and make better conditions for engineering professionals in our society. With the IEEE we have access to relevant publications and are in touch with distinguished professionals from all around the world. The Bosnia and Herzegovina Section was a proud host for the Region 8 Committee Meeting in Sarajevo in 2013. We are especially proud with the achievements of our students. The IAS SBC University of Sarajevo received in 2014 IEEE Region 8 Student Chapter of the Year Award, and several awards from the IAS, most recently as 2nd Most Happening Chapter globally. The PES SBC University of Sarajevo was also declared as Outstanding Student Branch Chapter in the PES. Our programmers are regular participants of the IEEEXtreme, and for many years were positioned among the top 25 teams. For me the most important achievement was a chance for our students to measure up with their peers and build their confidence in their knowledge and their abilities. Our Section is continually sponsoring participation in the Region 8 and Cross-section Students and Young Professionals Congresses, where they can enjoy being a part of the large community of engineering students. Can you tell us about any upcoming and exciting initiatives? Construction of a “Solar tree” at Campus University of Sarajevo, which will be used for battery charging, and also for analysis of the solar energy potentials. Smart home project, recently launched, for which our SB was awarded funding from the IEEE and our Federal Ministry of Science and Education. We plan for several PA trainings for YP members related to project management and writing project proposals. BiH went through a terrible war in the early to mid 1990’s which left the country devastated. Can you tell us a little about how an organization such as the IEEE can help rebuild relationships amongst ethnic groups and provide a platform for the betterment of youth? The role of an organization such as the IEEE is very important to help us recognize our abilities, capacity for development and building connections with our peers worldwide. This is especially significant for our students and young professionals to have possibility to build their skills and competences. The difficulties that these young people are facing during their education and in their careers are linked to devastation of industry and economy, lack of the resources, and these difficulties are the same, all around Bosnia and Herzegovina. With activities in our Section we try to facilitate our members in joint actions to bridge these gaps and overcome these difficulties. It is very important when these efforts are recognized and awarded, especially by Societies through their Chapters, as focal points of technical activities. We are very proud of achievements of our students and young professional members, but there are so many projects and ideas ahead of us. We would like with these activities to attract our young professionals to stay with us, with the IEEE , and to be able to offer to them support through the different stages of their career. Dušanka Bošković completed her tertiary education at the University of Sarajevo, Bosnia and Herzegovina, where she is currently an Assistant Professor at the Faculty of Electrical Engineering. Before joining the University, Dušanka was working on software development for embedded systems for Energoinvest – Institute for Computer and Information Systems (IRIS). Currently, she is teaching human computer interaction and biomedical engineering, and was the founding President for the Bosnia and Herzegovina National Association for Biomedical Engineering. In addition to teaching and research, Dušanka has been engaged in several projects promoting accreditation activities to improve quality of engineering education in Bosnia and Herzegovina. 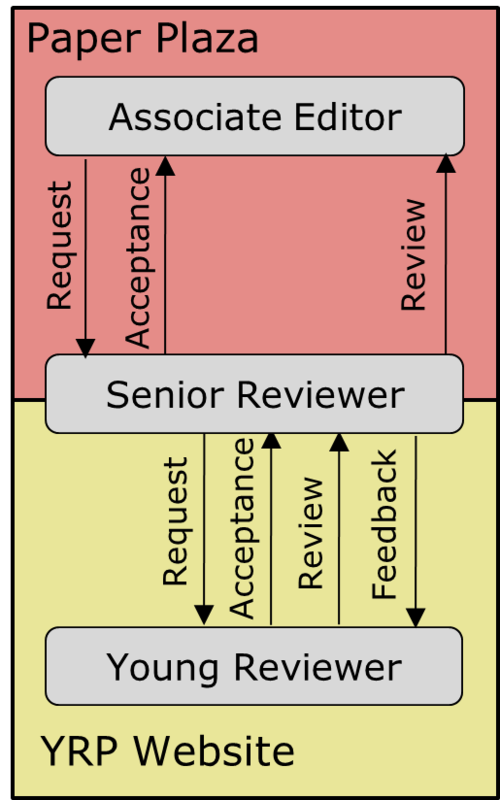 SR uploads the final review (revised by the senior member) to the Paper Plaza by the review deadline, as carried out traditionally (indicating the YRP involvement towards the Associate Editor). Noteworthy, serving as a SR in YRP will not increase the number of papers that the SR is asked to review. Only papers that a SR has already accepted to review would be eligible for the YRP. In this way, there will be no net increase in SR’s reviewing workload. Therefore, the time a SR would normally spend writing a careful review would be invested instead in developing skills of a Junior Reviewer. To become a YRP member as a Junior Reviewer, please register here. This is a fantastic initiative from RAS and will provide young professionals with the right training in becoming research reviewers and we hope that other technical societies will follow in their footsteps. As a species, humans have progressed tremendously in the past 10,000 years. We can now fly, talk to loved ones across the globe, access information on remote locations, study the human body and our planet earth with the most sophisticated technological instruments. We not only have landed on the moon and timed the landing with the precision of a second, but have robots investigating Mars for suitability of life. We have satellites looking down on us providing the most astounding views of planet earth. This is just the tip of the iceberg. The purpose of this article, however, is not to rest on our laurels but to scrutinize the mistakes we have made in the past. This article is intended to provide young professionals globally with a critical perspective of mistakes humans have made in hope that we learn from them. Very few mistakes we have made as a race come close to the abuse of the most powerful bomb ‘The Atom Bomb’. Though World War II ended with the atomic bombing of Japan, it instigated an arms race known as “the cold war” between the Capitalistic Bloc i.e. The United States and NATO allies and the Eastern Bloc i.e. The Soviet Union and the Warsaw pact allies, which encouraged both sides to build powerful atomic weapons. The scientists and engineers in United States and Soviet Union had only one purpose: To build more powerful nuclear bombs. In this article we review some of the critical events and lessons learnt. 6 August 1945: The atomic bombing of Hiroshima takes place. After sometime, a second bomb is dropped on Nagasaki by the United States. This basically ends World War II killing 150,000 people! But a lot more people die as a result of radiation from the bombing. This marked the beginning of the era of mass destruction. Joseph Stalin, the then General Secretary of the Soviet Union and the Dictator of the State decides he too wants to own a nuclear weapon, the Atom Bomb. 20 August 1945: Stalin orders Russian scientists and engineers to build him an Atom Bomb. 1946: U.S decides that it will test all its nuclear weapons on an Island 2700 miles southwest of Hawaii, Bikini Atoll. The native people living there are moved to a different island. A fleet of 90 Japanese, American and German warships are assembled in a lagoon near the island to witness the power of the Atomic Bomb. 25 July 1946: The first test of the Atom Bomb is conducted and all warships assembled in the vicinity are destroyed. At this point, only the United States knows how to build an Atomic Bomb. 29 August 1947: The Soviets tested their first Atom Bomb which was a copy of the Nagasaki bomb. The likeness was so much that it was believed that there were spies in the Los Alamos Project making the Atomic Bomb in United States. 1950: The spies are caught and 4 days after, the United States announces that it will design even more powerful weapons. The need to strike balance created a great rush in design exercises which resulted in the creation of the Hydrogen Bomb. The first Hydrogen Bomb intends to draw power from a fission reaction unlike the earlier Atom Bombs which worked as a result of a fusion reaction (splitting of atoms under immense pressure releasing vast amounts of energy i.e. 20 Kilotons which is equal to 20,000 tons of TNT). In comparison, the energy released from a Hydrogen Bomb is measured in Megatons (Millions of tons of TNT). At this point the US scientists and engineers believed that it is only a matter of time before the Russians will catch up. So now it is up to the Los Alamos scientists and engineers to build the world’s first thermo-nuclear bomb, the Hydrogen Bomb, codenamed ‘MIKE’. 1 November 1952: The first Hydrogen Bomb is tested, the world’s first man made thermo-nuclear reaction. But it weighed 82 tons and was not of much use. 12 August 1953: There is intense debate as to which group created the first portable Hydrogen Bomb. There is still debate to this day. But it is strongly believed that the Soviets built it. Could the United States do the same? March 1954: 6 months later, Los Alamos answers the Soviet Union by creating a Hydrogen Bomb from solid fuel made from the lightest metal on earth, Lithium, specifically Isotope Lithium 6. America’s super bomb is codenamed ‘Castle Bravo’. The bomb was only tested with liquid Hydrogen and not Lithium 6 which resulted in incorrect calculations. Even then, United States decides to test Castle Bravo on the northwest side of the Bikini Island. The bomb is to be triggered from the island of Enyu, 20miles away, from a water tight bunker protected by reinforced concrete and massive doors. 48 hours before triggering, all personnel except the firing men, are removed from Bikini Island. The expected energy from the explosion is 5 Million tons equivalent of TNT. If the explosion produces a higher energy release, no one within the 20 mile radius will remain alive. Question to consider: Why did the US test a bomb which they knew was never simulated with liquid hydrogen? Isn’t it an obvious lesson to never execute without thorough testing, especially when it’s the case of a bomb? It was poor judgement on behalf of the United States to ever test the Hydrogen Bomb without full knowledge. 1 March 1954: Castle Bravo is tested. The energy, heat and light from the explosion was so high that personnel on a ship 23 miles away could see the bones in their bodies. The aftershock produced a Tsunami. The explosion even got so close to the bunker that the concrete walls creaked. So what went wrong? Castle Bravo was not only made up of 30% Lithium 6 but also 70% Lithium 7 which was thought to be inert. However, on post analysis it was confirmed that the explosion went out of control and as a result, Lithium 7 became radioactive. This was something the scientists and engineers were not aware of, but should have been. Castle Bravo was designed to yield 5 Megatons of TNT, but because of the miscalculation, it resulted in an explosion of 15 Megatons of TNT. It also was directed towards Japan, another unexpected variation in the explosion that was not as per designs. There was a national outcry over radiation effects that not only affected people but also marine life. Question to consider: How much bomb testing is too much testing when it comes to destruction of natural resources? I think that considering that both parties, the US and Soviet Union, acted on fear alone of being bombed by nuclear weapons, it was already time to stop creating more powerful bombs. 1960s specifically 1961: By this time, United States has all the necessary technology and expertise needed to build bombs of all sizes, ranging from a few kilotons to megatons capacity. It was also in this time, that Soviet Union scientists and engineers started building long range missiles in response to the Castle Bravo. Relations between US and Soviet Union deteriorate even further. At this time, John F. Kennedy was sworn in as the 35th president of the United States. July 1961: President Kennedy decided to station half of the bombers in Europe on more alert. This freightened Nikita Khrushchev, the First Secretary of the Central Committee of the Communist Party of the Soviet Union who then called on Russian scientists and engineers to show US what the Soviet Union is capable of. He wanted the biggest bomb ever made in history dubbed the Tsar Bomb meaning the King of Bombs. The Castle Bravo exploded at 15 Megatons, but the Tsar was designed to explode at 50 Megatons. 30 October 1961: The seismograph in the US Military Monitoring Station in Alexandria, VA records a massive surge of activity. But the origin of this surge is not an earthquake, it is from a location inside Soviet Union territory. The only explanation to this event is that the Soviets have built a bomb more powerful than the United States ever had, a 50 Megaton weapon deliverable. This is 4000 times bigger than the Hiroshima atomic bomb. The Soviet Union tested the Tsar Bomb. The most powerful bomb ever made by man, created a mushroom cloud which peaked at 40miles, around 7 times the height of Mt. Everest. Buildings 70 miles away were destroyed, and windows shattered 300miles away. Analysis state that if the Tsar Bomb was detonated on Washington D.C. from an optimum height of 2000 Ft, the initial fireball will kill everything and everybody within 3 miles, people 12 miles away would suffer 3rd degree burns, most building 20miles will be destroyed killing 1 Million people instantly and 3.5 Million in total. The scientist who designed the Tzar Bomb estimated that 500,000 worldwide will suffer in the coming decades if the radiation deposited by the huge cloud slowly disappeared. The fallout of the Tsar Bomb is still classified. The United States test zone Bikini Island as of 1970 is still radioactive. 1963 – Finally both sides agreed to a Test Ban Treaty performing all further tests underground to avoid fallouts. So what can Young Professionals learn from this experience today? We can learn that progress for the sake of progress is not as great an idea as it may first seem, that progress at any cost often results in very high costs paid by countries and people of the world. Our lessons learnt are also that politicians must not drive technological progress the way they did during the Cold War. Building such weapons in the name of protection of one’s own countrymen does not make them any less destructive to neither man nor nature. So as scientists and engineers, if we have the capability of building such technology, technology that has the capacity for mass destruction, then it is our duty to ensure that all steps are taken to avoid mass destruction. Power against power and meaningless wars only create destruction of our world as we know it.